I've been begging my husband for months to go on a nice fun weekend mini-vacation. When I realized I was making headway, I researched some places where we could go that were in a reasonable driving distance to where we live. So while I was researching places on the internet, I was playing around on my facebook page and somehow I ran across a fan page for Cupcakes For Cures. 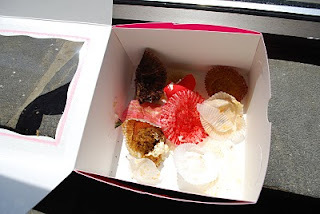 "Cupcakes"? Well, of course that sparked my interest (I'm overly obsessed with cupcakes). Upon further investigation, I learned that Cupcakes for Cures was a cupcake competition taking place in Asheville, NC in order to raise funds for the American Cancer Society. The Cupcakes for Cures is the idea of a couple of Ashevillians who created the competition as part as their Relay for Life Team. Genius!!!!!! Competitors included professional bakers, amateurs, and youth. 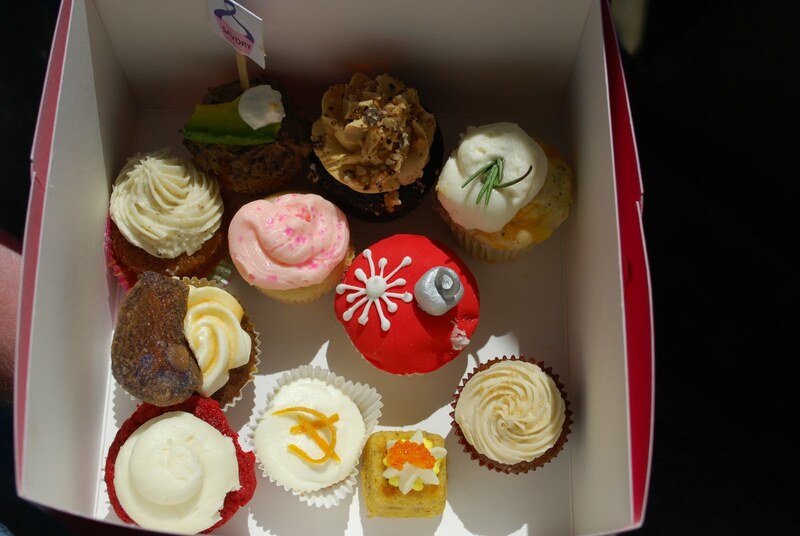 The categories for the cupcakes were: Best Birthday, Best Gluten-Free, Best Holiday or Special Occasion, Best Savory, Best Beer, and Best Local Foods. I tried several from all categories and they were all amazing. I'm telling you I didn't taste one that I didn't like. The husband and I had lots of fun sampling so many delicious cupcakes. This is a picture of the Best in Show. 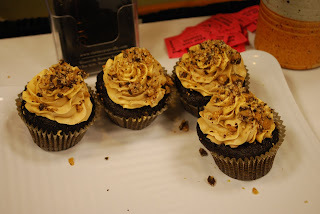 It is a Guinness Cupcake with a Coffee Meringue Buttercream with Toffee Sprinkles on top. Yeah, it was phenomenal! 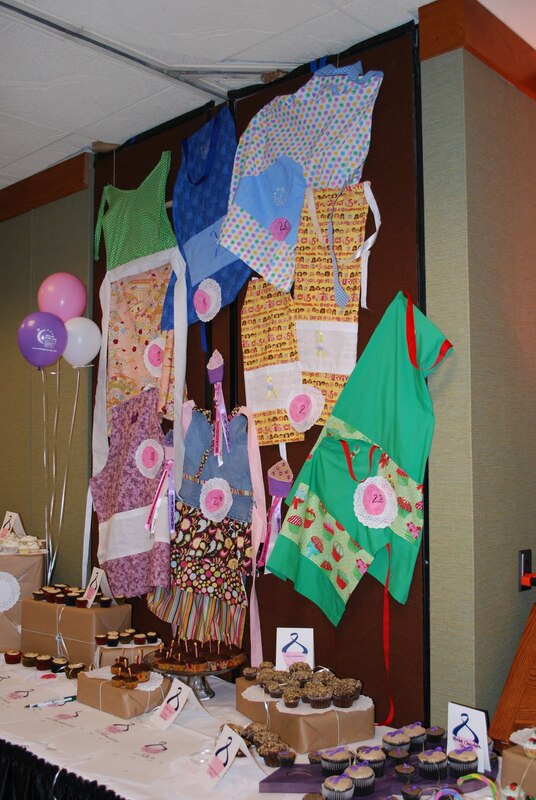 People donated hand-made aprons for the apron auction! I got a matching pair (one for me and one for my daughter) with cupcakes on it, of course!!! Wow!!! The sugar buzz begins! The 1st place winners in all the categories got some killer gift baskets with tons of wonderful stuff like insanely cute cupcake liners, sprinkles, toppers and even cupcake bandaids (aahh)! I was definitely drooling over them! 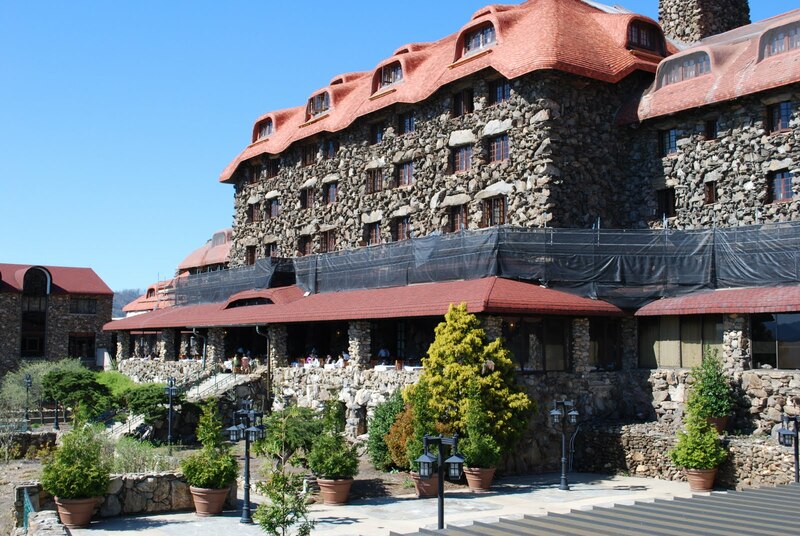 The Best In Show prize was a dinner, 1 night stay and breakfast at the Grove Park Inn. Not too shabby! We had a really fun time and it was great knowing that while we were stuffing our faces with awesome cupcakes, we were also helping to contribute to the fight against cancer! Wow, I wished I had known about this! 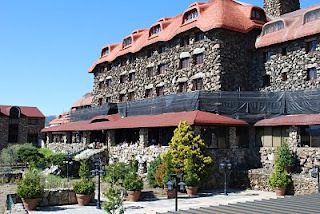 I live about 4 hours away from Asheville and always looking for a reason to visit! You have an awesome blog Shannon! Keep up the great work! Thanks so much for the comment. It made my day!! I look at your blog and website like everyday. I loooooove cupcakes and I totally wish I could decorate like a pro. I am actually from the Chattanooga area (north Georgia to be exact)but currently living in Nashville. The website for the event is www.cupcakesforcures.com if you would like more info!!!!! !